Chris Hardy--The Lancer Cup, which took place on April 12, featured the championship game for the soccer intramurals. The vuvuzelas were out in full force at California Baptist University’s front lawn all in an effort to celebrate the Lancer Cup. 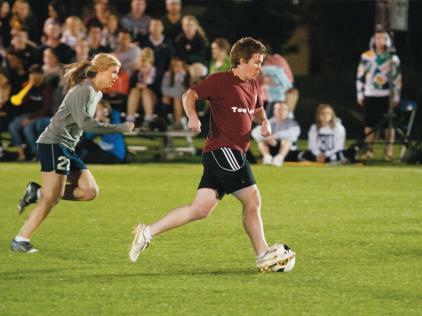 The Lancer Cup is the annual championship event for CBU’s recreational soccer league. The April 12 event featured a rematch of last year’s Lancer Cup between the Silver Bullets and Too Legit teams. It was a full night of festivities for students as CAB hosted a preparty prior to the game. The pre-party featured catered Mexican food from Izzy’s Baja Grill, human foosball and a mechanical bull. One of the highlights of the night undoubtedly was when CAB gave out 300 commemorative vuvuzelas and black stools with the Lancer logo on them to a line of eager students. Following this came the opening ceremonies narrated by the night’s commentators Carson Belmont and Josh Mott. Belmont and Mott then introduced the two teams and the referees Daniel Bishop, Jeff Couto and Taylor Neece. But before playing, chapel worship band vocalist Jessie Kay led the crowd by singing the National Anthem. Once all of the formalities were out of the way, the action could begin – ” and it began quite quickly. After just six minutes of play the Silver Bullets took the lead, 1-0, from a header by Manny Martinez; the assist came off a beautiful corner kick from game MVP Taylor Welch. Ten minutes later Welch juked around defenders and scored the game’s second goal, ironically off an assist from Manny Martinez. This had the Silver Bullets running away with the game as they took a 2-0 lead into halftime. The first half was a tight defensive battle with the teams working hard at both ends to hold the other off. Most of the offensive chances for Too Legit came from the foot of team captain Scott McCollum. At halftime, the annual “Golden Whistle Award,” for the seasons best referee was presented. The award went to none other than Taylor Welch. Also during halftime, the crowd sang a rousing rendition of “Happy Birthday” to Too Legit team member Kara Kitchen. The second half began with several minutes of stellar defense and goalkeeping as the teams went back and forth with no scoring. This is when the announcers got bored and decided to debate the meaning of the word touché. 17 minutes into the half “Castman” Adam Alexander scored to put the Silver Bullets ahead 3-0, which would ultimately be the final score. Alexander’s goal was perhaps the most impressive of the night as he played the entire game with his arm in a cast, wrapped in bubble wrap, due to a broken arm he suffered during a snowboarding trip over spring break. Silver Bullet’s victory means they are now back-to-back Lancer Cup champions and Welch earned his second MVP award of the year. He was also MVP of Fortuna Bowl. Lancer Cup was the last major event for the school year. Throughout the night, fans heckled, made music with their vuvuzelas and one even brought a giant fake giraffe. “It’s Intramurals! It’s all about having fun,” Welch said. Following the championship game the Silver Bullets took on a staff team featuring Ian Price, Ryan Jorden, Jennifer Price, Gregg Schroeder and more. The event was sponsored by the Campus Activities Board.